The Actor Ichikawa Omezō in the Role of Soga no Gorzō, 1792. 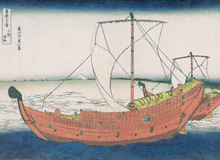 Nishiki-e (polychrome woodblock print), 27.2 x 12.7 cm. Rijksmuseum Volkenkunde, Leiden. 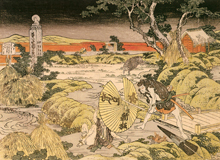 Spring at Enoshima (Enoshima shunbō), from the series The Threads of the Willow (Yanagi no ito), 1797. Nishiki-e (polychrome woodblock print), 24.9 x 38 cm (Ōban). British Museum, London. Suehirogari, 1797-1798. 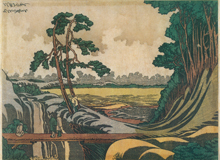 Nishiki-e (polychrome woodblock print), 20.7 x 31.9 cm. Library of Congress, Washington, D.C. 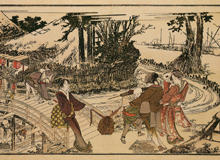 Crossing a Bridge, from the kyōka album Men's Stamping Dance (Otoko dôka), 1798. Nishiki-e (polychrome woodblock print), 21.4 x 36.4 cm (Ōban). Museum of Fine Arts, Boston. The Sanctuary of Jūnisō in Yotsuya, Edo, late 1800s. 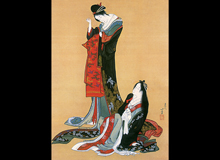 Nishiki-e (polychrome woodblock print), chūban. Tokyo National Museum, Tokyo. Standing Courtesan with an Apprentice, c. 1802. 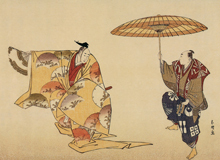 Kakejiku, ink and colour on silk, 76.5 x 41.2 cm. Hokusai Museum, Obuse. 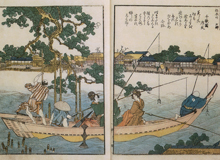 Illustrated Book of the Two Banks of the Sumida in One View (Ehon Sumidagawa ryogan ichiran), 1805. 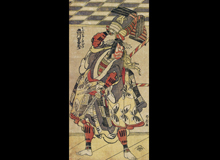 Ehon, nishiki-e (polychrome woodblock print), 28.5 x 19 cm (each page). Chiba City Museum of Art, Chiba. Act V, from the series The Syllabary Chushingura (Kanadehon Chushingura), 1806. Nishiki-e (polychrome woodblock print), 25.1 x 37 cm. British Museum, London. 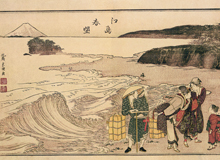 At Sea off the Kazusa Coast (Kazusa no kairo), from the series Thirty-Six Views of Mount Fuji (Fugaku sanjūrokkei), c. 1830-1832. Nishiki-e (polychrome woodblock print), 26 x 38.4 cm (Ōban). Private collection.